IDAHO FALLS, Idaho -- Utah State University agricultural economist Ryan Larsen expects 2017 will be another down year for agriculture, with a global supply glut putting downward pressure on the prices of major commodities after a string of strong production years. "There's no indicator to point to any major changes in 2017 on the commodities side," Larsen said during a Dec. 7 presentation on the U.S. and global agricultural outlook during the annual Idaho Ag Outlook Seminar. Larsen predicts farmers will continue drawing on their equity to free up working capital and continue operating. He also expects regulators to downgrade farm loans as producer profit margins tighten, and he expects some banks to be tempted to move toward justifying loans based more on collateral than cash flow -- a situation that helped lead to the financial crisis of the 1980s. "How many years can a bank justify loan exemptions to a borrower?" Larsen asked, explaining grower profitability has in many cases fallen below lender requirements. Larsen said Russia, Ukraine and Kazakhstan have reported record or near-record wheat yields. Russia also had a record corn crop, and Ukraine corn yields were near record levels. Brazil has forecast a record soybean crop. Idaho Barley Commission Administrator Kelly Olson said demand for grain is strong, with U.S. wheat use expected to increase 16 percent in the 2016-2017 marketing year, and domestic corn use expected to increase by 7 percent. But it won't be enough to keep up with a huge supply, she said. Wheat stocks are projected to end the marketing year up 17 percent in the U.S. and 3 percent globally, while ending corn stocks should be up 38 percent in the U.S. and 4 percent globally. "We've had two or three years of above-average production across the world," Olson said. "We have large stocks of crops, and that's not driving any prices up." Larsen said a recent report by an equipment manufacturers' association shows an increase in sales of combines and four-wheel-drive tractors. It's a sign to him that farmers are "starting to settle into this moderated price forecast we're seeing." Within the Midwest, Larsen predicts the coming year will bring increased scrutiny by agricultural lenders and a greater risk of growers defaulting on their operating loans. Larsen ran calculations based on financial information from 500 sample farms throughout the Midwest predicting their likelihood of defaulting on loans. In 2012, farms in the sample averaged below a 2 percent chance of defaulting. The number rose above 3 percent in 2016 and will likely top 4 percent in 2017, he said. 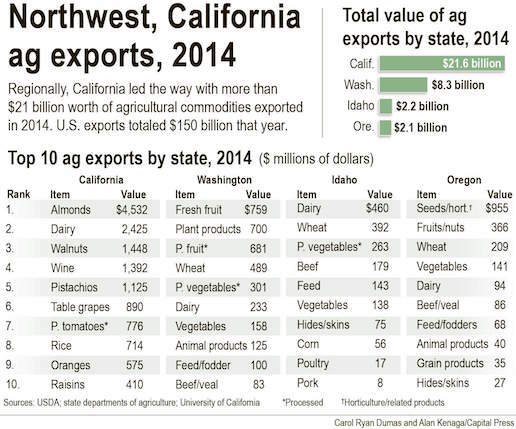 Thanks to its diversity of crops, he said Idaho's farm economy downturn has lagged the Midwest. "I think 2017 is going to be a pivotal year in the Midwest, and I think we're still a year or two out in Idaho before we start seeing any major issues," Larsen said, adding producers who have grown their operations at a moderate pace and haven't invested a large percentage of their revenue in machinery or expanded rapidly through cash land rentals should be on more solid footing for the downturn. Doug Robison, a senior vice president with Northwest Farm Credit Services, said he's starting to see "earnings weakness show up with some producers, but probably not on the scale that Larsen was referring to." Robison said growers who produce hay and grain have been vulnerable but he still expects some Idaho producers to make profits in 2016. However, he acknowledged budgeting for 2017 will be a tough task for farmers statewide.